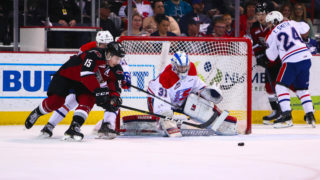 The Vancouver Giants improved to 2-0 on the road and 4-1 on the season Wednesday night with a 5-0 victory over the Kelowna Rockets. 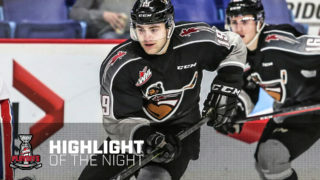 James Malm powered the Giants offense with three goals and Trent Miner turned aside all 21 shots fired his way to earn his first career WHL shutout, and the first Giants shutout victory in Kelowna since February, 2007. Davis Koch and Brayden Watts also added goals for the Giants. 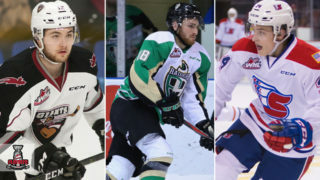 Fresh off a first-star performance Sunday against Spokane, Giants forward Brayden Watts wasted little time getting the Giants on the board Wednesday. Just 3:32 into the game, he took a slick feed from Mlios Roman, skated in alone on Rockets starter Roman Basran and stuffed a backhand shot past his left leg for his second goal in as many games. Later in the period James Malm registered his first of three goals on the night when he beat Basran off a shot from the right-wing circle. Malm’s goal came via the power play which finished two-for-five on the night for Vancouver. Malm was far from done. Less than three minutes later, Malm struck again. This time it was off a rush down the right-wing. Malm threw the puck between his legs, then dragged it wide by Kaedon Korczak before stuffing home a forehand shot past Basran’s right leg. It was a WHL Play of the Year type goal that put Vancouver ahead 3-0 which is how the first period ended. Trent Miner and Roman Basran were both sharp in period two, combining for 23 saves. Miner’s busiest period was the second, where he stopped nine Kelowna attempts. His best save came off Kyle Topping from in close. Basran at the other side was equally sharp as he made some notable saves off point-blank chances to keep his team within striking distance through 40 minutes. James Malm completed his natural hat-trick at the 10:23 mark of the third period when he converted on his second power play goal of the game from a similar spot where he scored his first one. Dylan Plouffe earned the lone helper, securing his second assist of the game. Malm’s third of the night and seventh of the season moved him into the league lead for goals through five games. Davis Koch added some final insurance for the Giants at 18:23 when he scored his first goal of the season off a nice feed from Yannik Valenti. 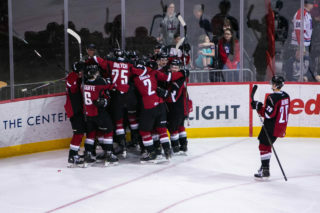 Moments later, Trent Miner was mobbed by his Giants teammates once the final buzzer had echoed through Prospera Place. He earned 3rd star honors in the game while Plouffe (2nd Star) and Malm (1st Star) were also recognized. The final shots were 37-21 for the Giants who killed off all three of Kelowna’s power play attempts while going two-for-five on the man advantage themselves. 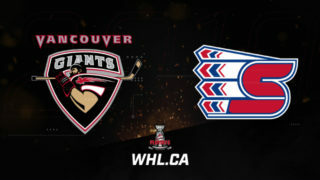 The Giants will now head North for two games in Prince George beginning Friday night at 7:00 PM From the CN Centre. Wednesday’s shutout win for Trent Miner and the Giants in Kelowna was their first road shutout against the Rockets since February 28th, 2007. Blaine Neufeld earned the shutout that night for the Giants stopping all 10 Rocket shots he faced. Yannik Valenti earned his first WHL point with an assist on Davis Koch’s third period goal.